I Read Stuff! : There Can Be Only One! ...or millions if you’re a Turritopsis. 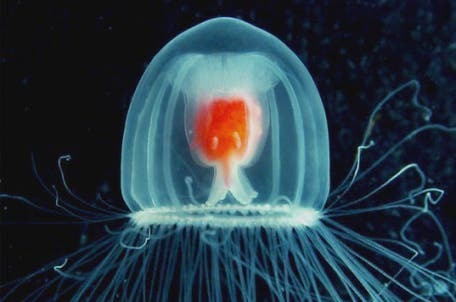 Turns out this jellyfish has figured out how to live forever. The trick is to go through puberty in reverse. After growing all the way up and asexually growing some babies. The adult Turritopsis reverses the process by reabsorbing its tentacles. It then turns itself inside out and reattaches to a surface. Once attached the babies are released, and the Turritopsis regrows its body to become young again. Currently Scientists say they have no evidence that the Turritopsis will ever die barring disease, predators, and sword swinging MacLeods. That's a tough question...however, I wasn't sleep deprived in junior high and I really didn't have any responsibilities other than kitty litter...doesn't sound too bad. However, what Jamie said about you in the lunch room is super important again... I mean, I could just die! Regressing to the same mental state as my junior-high self? No friggin' way. If I had my same memories and knowledge, heck yes. I can go through pimples and hair growth in a general plague theme again and again to live forever.